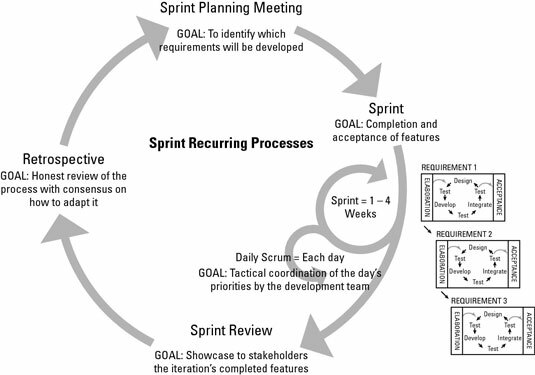 Scrum, the most popular agile framework in software development, is an iterative approach that has at its core the sprint — the scrum term for iteration. Scrum teams use inspection throughout an agile project to ensure that the team meets the goals of each part of the process. Within each sprint, the development team builds and tests a functional part of the product until the product owner accepts it and the functionality becomes a potentially shippable product. When one sprint finishes, another sprint starts. Scrum teams deliver product features in increments at the end of each sprint. A product release occurs at the end of a sprint or after several sprints. During a sprint, you conduct constant inspections to assess progress toward the sprint goal, and consequentially, toward the release goal. You hold a daily scrum meeting to organize the day by reviewing what the team completed yesterday and what it will work on today. Essentially, the scrum team inspects its progress toward the sprint goal. At the end of the sprint, you use a retrospective meeting to assess performance and plan necessary adaptations.